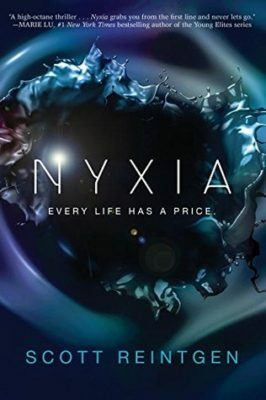 Read a full summary of Nyxia by Scott Reintgen now! This page is full of spoilers so beware. If you are wondering what happened in Nyxia, then you are in the right place! Emmett is one of ten teens (four girls, six boys) recruited by Babel Communications to board the spaceship, Genesis 11 and travel to an inhabitable planet called Eden. A valuable substance called nyxia can be found on Eden, and Babel plans to mine for it. The problem is that people, known as Adamites, already live on Eden and they are hostile to the people from Earth. They watch a video of people being slaughtered by the Adamites. A small child is spared. They think she may still be alive on Eden. It’s believed that they can no longer reproduce, so they value children. Thus these ten kids are recruited and will train to go mine for the nyxia in place of the adults. Emmett and the nine others learn that on the year-long voyage to Eden they will have a competition among themselves and only eight will actually get to go to Eden and earn their benefits package: a trust fund, insurance, and $50,000 a month for the rest of their lives. The remaining two will receive two years pay for their time. Emmett wants to win. His mother has cancer and can’t get the treatment she needs right now. I give it 3 stars overall. The kids are recruited from around the world. They are of several different races and languages, but a communication mask/translator allows them to communicate easily. One common theme emerges: they all come from poverty. Emmett’s roommate is a Japanese girl named Kaya. The medic assigned to help them and mentor them is Vandemeer. They learn that he will get a bonus if his recruits make it in the top eight. Everything is a competition. There is a point system, and rankings are displayed at all times. Emmett gets off to a slow start and fears he might not make the cut. They have individual competitions, and they are also put on teams and have group competitions. Each of the ten is given a small amount of nyxia so that they might practice using it. Nyxia can be manipulated using only your mind to take any shape you wish. If they try to manipulate too much nyxia at one time, the nyxia fights back, and they black out. They spend their days learning to fight and to manipulate and mine the nyxia—ten days of training, then one Sabbath day for rest. They wonder why they need so much fight training. They perform several simulations to hone their skills and fight for ranking points. Kaya and Emmett become good friends and agree to help each other. Kaya claims to see people and their brokenness as colors. She and Emmett are alike. Emmett is pulled aside for mercilessly punching Roathy in individual combat that was supposed to be more simulation than physical combat. The other boy is out for several days, and so Emmett earns an enemy not only with him but also his team and his girlfriend, Isadora. He feels bad but maintains he was just playing the game. He grew up learning to fight from his uncle. Over time the competitions and training grow harder and harder. At first, Longwei consistently stays ahead and always keeps an emotional distance from the other players. Emmett moves up and down the scoreboard. Emmett’s team is made up of himself, Jaime, Azima, Kaya, and Isadora. They compete together in what is called the Rabbit Room on a conveyor belt type simulation exercise. Kaya becomes an unspoken leader because she has the best strategic plans. But after weeks of working together, Defoe mixes the teams up for nyxian mining training. Now it is Emmett, Longwei, Roathy, Katsu, and Jazzy. Emmett is wounded very badly as he fights Jaime one-on-one and it looks like it was on purpose. He is stabbed in this side using a real blade. The doctor who switched the blades out says he was threatened by his two trainees, Roathy and Isadora. Emmett is given the opportunity to kill the doctor for punishment (Primal Law rules in this case), but he decides to let him go. He doesn’t want to be the person that they think he is. When he returns, he has fallen in ranking quite a bit, and he is also rusty in training and terribly slow. He has ground to make up. Emmett and the others are able to talk to their families occasionally. On one occasion when Emmett talks to his dad, he mentions an article that Babel put out on Earth about all of them. It seems that they are famous. But when Emmett’s dad tries to tell him more about it, Babel keeps them from conversing. Emit convinces Kaya to explore with him using a key that he stole from Defoe. They discover many parts of the ship that they had never seen before. They even find a no-gravity area. Kaya is becoming obsessed believing that there is something that Babel is hiding. She wants to find out what it is. On one of their secret outings, they find a new area where a large man is being held and has obviously been tortured. He is an Adamite, and later we learn that his name is Erone. He slowly wakes and starts manipulating the Nyxia that Kaya has formed into a necklace and wears around her neck. They tried to stop him, but he chokes her with it. Defoe bursts in and takes control of the nyxia, and Vandemeer tries to revive her, but she is dead. Emmett is devastated and after that Emmett and his team use Kaya’s tactics in the Rabbit Room, and they win. Finally, after many more months, they arrive at the space station near Eden. There will be one more month of training and competition before they go to planet. The twist is that they are on Genesis 11 and another group of trainees is on Genesis 12. Their teams will compete. Three will be chosen as captains, and their salaries will double. Fifteen of the twenty trainees will get to go to Eden. It seems that the leaders of these two space vessels, Defoe and Requine, are in a kind of competitive game as well. The leader of 12 is the one that abducted the Adamite that is now on Genesis 11. Babel Communications did not put out the news story, but rather someone is digging around in their company and wishes to expose what they are doing. The leak was the fault of someone Earthside, named Roman Beckett. The trainees from Genesis 12 are much more organized and have a better relationship with each other than the ones from 11. Too many enemies have been made on Genesis 11. The leader of the other crew is a girl named Morning. She is very good, and they never lose in their competitions when she is leading. All of their competitions are now on something called the Waterway. It is different every day, but they race boats down a river with simulated obstacles. Because Kaya is gone and Genesis 11 only has nine people, one person from Genesis 12 sits out every day. Eventually, Emmett starts a relationship with Morning. They both want each other to get to go to Eden but Morning has made promises to her crew that trump Emmett. As their time comes to a close, some trainees have secured their spot to Eden. Emmett is not one of them, and neither is Roathy. Roathy and Isadora attempt to harm Emmett so that he can no longer compete. But strangely, the nyxia helps him protect himself. Near the end, he realizes that he is going to have to take Morning out of the Waterway competition in order to win. So he does by sacrificing himself and her overboard their ships. He secures his way to Eden knocking one of Morning’s crew and Roathy out of the runnings. On the day they are to descend in their individual pods to Eden, they find that Babel has one more twist up their sleeve. All of the trainees that didn’t get to go, have one more chance to win their spot. They have to fight one of the other trainees to the death to get on the pod. The one who doesn’t make it is left to be sucked into space. It is a fight to the death and Roathy is pitted against Emmett. Emmett wins their duel and uses nyxia to seal Roathy in the airlock so that he won’t be left to die. Emmet plummets to Eden alone not knowing if his other friends lived or died in their own fight to the death. There you go! That’s what happened in Nyxia. Hope you enjoyed this recap of Nyxia with spoilers. Click to buy Nyxia or book two, Nyxia Unleashed and help us pay for hosting! Oh and share this with your friends who might like to read a recap of Nyxia. Roathy was born in the Triarch Empire.